Version 3.1.93.0 of the AWS Tools for Windows PowerShell now includes support for tab completion of parameters that map to enumeration types in service APIs. 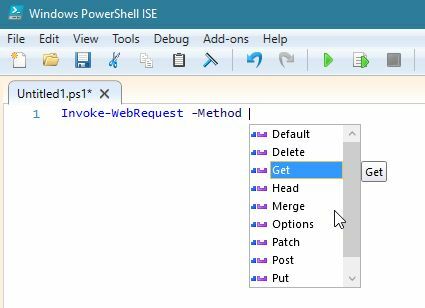 Let’s look at how these types are implemented in the underlying AWS SDK for .NET and then see how this new support helps you at the Windows PowerShell command line or in script editors (like the PowerShell ISE) that support parameter IntelliSense. This ability to adopt new values also applies to the response data from the service. The SDK will simply unmarshal the response data and accept the new value. This is unlike what would happen with the use of real enum types that would throw an error. You are therefore insulated on both sides from services adding new enumeration values when you want or need to remain at a particular SDK version. PS C:> New-EC2Instance -InstanceType ??? As we noted, the underlying SDK does not use regular .NET enum types for the allowed values so there’s no data for the shell to run against in order to offer a suggestion list. Obviously this is a problem when you don’t know the permitted values but it’s also an issue when you know the value but not the casing. Windows PowerShell may be case-insensitive but some services require the casing shown in their enumerations for their API call to succeed. One way to tackle this problem would be to use PowerShell’s ValidateSet attribution on parameters that map to service enumerations, but this has a shortcoming: validation! Using the example of the -InstanceType parameter again, should EC2 add a new type you would need to update your AWSPowerShell module in order to use the new value. Otherwise, the shell would reject your use of values not included in the ValidateSet attribution at the time we shipped the module. The ability to make use of new enumeration values without being forced to recompile the application with an updated SDK is very useful. It’s certainly a capability we wanted to extend to our Windows PowerShell module users. We can also use the Tab key to iterate through the completions one by one or we can enter a partial match and the resulting completions are filtered accordingly. Support for custom argument completers was added in Windows PowerShell version 3. Custom argument completers allow cmdlet authors and users to register a script block to be called by the shell when a parameter is specified. This script block is responsible for returning a set of valid completions given the data at hand. The set of completions (if any) is displayed to the user in the same way as if the data were specified using ValidateSet attribution or through a regular .NET enum type. Third-party modules like TabExpansionPlusPlus (formerly TabExpansion++) also contributed to this mechanism to give authors and users a convenient way to register the completers. Beginning in Windows PowerShell version 5, a new native cmdlet can perform the registration. In version 3.1.93.0 of the AWSPowerShell module we have added a nested script module that implements argument completers across the supported AWS services. The data used by these completers to offer suggestion lists for parameters comes from the SDK enumeration classes at the time we build the module. The SDK’s data is created based on the service models when we build the SDK. The permitted values are therefore correctly cased for those services that are case-sensitive; no more guessing how a value should be expressed when at the command line. # types, check on command name concatenated with parameter name. # after filtering against $wordToComplete, but our members are already sorted. When the AWSPowerShell module is loaded, the nested module is automatically imported and executed, registering all of the completer script blocks it contains. Completion support works with Windows PowerShell versions 3 and later. For Windows PowerShell version 5 or later, the module uses the native Register-ArgumentCompleter cmdlet. For earlier versions it determines if this cmdlet is available in your installed modules (this will be the case if you have TabExpansionPlusPlus installed). If the cmdlet cannot be found the shell’s completer table is updated directly (you’ll find several blog posts on how this is done if you search for Windows PowerShell argument completion). To accompany the new completion script module we made one other significant change in the 3.1.93.0 release: to add an Authenticode signature to all script and module artifacts (in effect, all .psd1, .psm1, .ps1 and .ps1xml files contained in the module). A side-benefit of this is that the module is now compatible with where the execution policy for Windows PowerShell scripts is set to "AllSigned". More information on execution policies can be found in this TechNet article. We hope you enjoy the new support for parameter value completion and the ability to now use the module in environments that require the execution policy to be ‘AllSigned’. Happy scripting!